We’d love your help. Let us know what’s wrong with this preview of Lunch Lessons by Ann Cooper. Remember how simple school lunches used to be? You'd have something from every major food group, run around the playground for a while, and you looked and felt fine. But today it's not so simple. Schools are actually feeding the American crisis of childhood obesity and malnutrition. Most cafeterias serve a veritable buffet of processed, fried, and sugary foods, and althoug Remember how simple school lunches used to be? You'd have something from every major food group, run around the playground for a while, and you looked and felt fine. But today it's not so simple. Schools are actually feeding the American crisis of childhood obesity and malnutrition. Most cafeterias serve a veritable buffet of processed, fried, and sugary foods, and although many schools have attempted to improve, they are still not measuring up: 78 percent of the school lunch programs in America do not meet the USDA's nutritional guidelines. Chef Ann Cooper has emerged as one of the nation's most influential and most respected advocates for changing how our kids eat. In fact, she is something of a renegade lunch lady, minus the hairnet and scooper of mashed potatoes. Ann has worked to transform cafeterias into culinary classrooms. In Lunch Lessons, she and Lisa Holmes spell out how parents and school employees can help instill healthy habits in children. They explain the basics of good childhood nutrition and suggest dozens of tasty, home-tested recipes for breakfast, lunch, and snacks. The pages are also packed with recommendations on how to eliminate potential hazards from the home, bring gardening and composting into daily life, and how to support businesses that provide local, organic food. To ask other readers questions about Lunch Lessons, please sign up. I've been following Chef Ann via her informative blog and her weekly podcast and think she is doing some very important work in regards to waking up the country about children's dietary habits and was thrilled when I received the ARC in the mail. I became interested in the subject when my 2nd grade daughter began developing migraines that made her so ill she'd turn as pale as a ghost, get nauseous, and be unable to do much of anything but take a nap in a dark room until it passed. They were so ba I've been following Chef Ann via her informative blog and her weekly podcast and think she is doing some very important work in regards to waking up the country about children's dietary habits and was thrilled when I received the ARC in the mail. I became interested in the subject when my 2nd grade daughter began developing migraines that made her so ill she'd turn as pale as a ghost, get nauseous, and be unable to do much of anything but take a nap in a dark room until it passed. They were so bad at one point that she seemed to be spending more time in bed or in the school nurse office than in class. After many attempted fixes including limited activity, stress, ear-plugs, her migraines are under control without medication. The main culprit appeared to be the food I was feeding her. Particularly processed snacks like Cheetos & Doritos which are laden with MSG, a major migraine trigger, I soon discovered. I always thought MSG was something used only as a filler in Chinese takeout. Boy, was I mistaken. Aspartame is another biggie used in everything from low-cal puddings to bubble gum. I have since changed our entire dietary habits excluding nearly all of the processed junk (and was that ever painful!) with the exception of organic cookies, snacks and the limited few items that don't contain MSG, *natural* flavor, yeast extract and all of the other names the big food processors "hide" MSG under. And I was stunned to see just how much of this stuff was being served in school. Lunch Lessons begins by outlining everything that is wrong with our current food system. It clearly explains what children should be eating and explains why children need to stay away from additives, corn syrup, fast food, trans fat, etc. Did you know that children born in 2000 and after who are following the current trend of the fast food, prepared food nation, are facing a shorter life span than their parents? I didn't but it makes since with obesity and diabetes on the rise in the young. There is a chapter devoted to outlining the caloric needs of a growing child, which food groups are actually necessary for correct development and a helpful chart explaining portion sizes and the number of servings to eat per day based upon the child's age. The book is filled with tools to help anyone learn to change their eating habits and lifestyle (and it is a huge lifestyle change) and I'd bet even those without children would find it a very useful reference and jumping off point for dietary change. The middle section of the book tells about several schools systems who bravely changed the menu by eliminating pre-packaged processed food and brought in whole foods from local farmers. The stories, especially the comments from the children, are inspiring and hopeful. What surprised me the most were the positive social experiences these children enjoyed while tending to a garden and preparing their healthy meals. The recipe section is filled with lunch options I've never before considered. I tend to get stuck in a rut with whole grain bread, natural PB&J, turkey cold-cuts, etc. and I'm not sure if my kids will go for some of the more radical options like couscous but I'm going to give it a shot. I never thought of packing home baked mac & cheese or chicken pot pie but those are two faves I'm betting will get them more excited about lunch. The only negative, and it's hopefully present only in the review copy, is the fact the flow of the text is constantly interrupted by boxes of other information. It's a bit of a pain to be all wrapped up in an idea and then to have to turn a page to get to the end of the article and then have to back track to read the info. in the boxes (similar to reading a magazine). This is a book that will remain in personal collection and one I'm betting I'm going to be picking up on a weekly basis as I prepare my meals. Update: I made the Chicken Pot Pie & the potato (minus the chive) biscuits. It took me a mere 2 1/2 hours (she says very sarcastically) what with all the chopping and cooking but my son LOVED it. He had two helpings and ate it again for dinner the 2nd night. It came out more like a hearty chicken soup with biscuits on top rather than the crusty frozen pot pies I used to "bake" but the kids didn't seem to mind and it was so cheap to make! Next time I'm skipping the potato biscuits and dropping some dumplings in instead. I took this home because I thought it might give me some healthy, easy lunch ideas. Instead it served, in a round about way, to make me realize again that educating our children is more than just school lessons - everything and every part of life is teaching them lessons they'll carry with them for the rest of their lives. Including how and what they eat and the attitude they have towards food. And thinking abut that led me to thinking about how I would hope to bring children up to see food as a I took this home because I thought it might give me some healthy, easy lunch ideas. Instead it served, in a round about way, to make me realize again that educating our children is more than just school lessons - everything and every part of life is teaching them lessons they'll carry with them for the rest of their lives. Including how and what they eat and the attitude they have towards food. And thinking abut that led me to thinking about how I would hope to bring children up to see food as a joy and a way of celebrating life, something to be enjoyed but not be a slave to. I would hope that they would grow up understanding moderation, and esteeming quality ingredients and homemade dishes above the packaged and prepared. I want to raise a fearless eater. ... which led me to realizing that I need to whip some of my own habits into shape before I even think about trying to pass them on to a mini-me, so, yeah. A side note in one of the chapters that I found very interesting was the recommendation to skip all the bland rice cereal and, when babies are ready to start on solid foods, offering them small, mashed portions of whatever the rest of the family is eating. Not only is the classic rice cereal heavily processed (raising a child's insulin and blood sugar levels), but eating habits are formed very early in life and keeping children in a diet of bland, simple foods may lead them to seek less variety in their diets as they get older. Despite the fact that pediatricians have recommended these types of bland baby foods, there's no evidence that normally spiced food causes any harm, and if you look around the world, you'll see that the bland food for babies is really only something you see in western cultures. Speaking of variety in diet, apparently 99% of today's agriculteral production depends on only 24 different domesticated plant species. horrifying and exciting at the same time. so far excellent. the turkey meatloaf recipe is outstanding - looking forward to trying other recipes. Update - just re-read this. After spending the past 4 months working lunch at my younger child's preschool it is even more clear to me how important this issue is. What most parents appear to consider a healthy lunch is just ... not. And that's not even touching the school cafeteria issue. This book deals with more than just lunch - it offers comprehensi horrifying and exciting at the same time. so far excellent. If you are interested in organic food and/or in cooking, you should read this book. It's a chronicle of one woman's fight to change the school lunch system at a school in California. When you read about what the public school systems feed children, you will freak out. It's pretty sad. I also saw this woman speak at a book reading in D.C. and I just got a good feeling about her in general. The recipes looked good but just weren't my style of cooking - a little to high maintenance for me. The book gave depressing information about our school lunch program and lots of information on how to change it. Unfortunatelyu, I have enough energy to pack my own kids lunch and that's about it. This was pretty dry. A lot of good information. (Don't start babies foray into the world of real food with highly processed/super bland rice cereal; get the kids involved as much as possible; variety!!! Etc. So yeah, informative but dry as toast, whole grain toast. I checked this out of the library because even though I don't have kids I am a nutrition and food policy book. This book looks at the history of school lunches, the basics of good childhood nutrition, recipes and ideas for and example of changes to make. Interesting read and although the book was published in 2006 the info is still pertinent and a bit disheartening to see how little has changed across America. This had great information and I loved hearing about the schools that have incorporated better school lunch programs. There's some cool stuff out there. I wish I was the kind of person that could make something happen here, but at least it makes me want to be involved in something somehow. The authors were smart and put a bunch of recipes in the last part, so I feel like in order to truly get the most of out this I would need to buy it....tricky eh? I thought this was just going to be a book about lunch recipes or something. I was suprised, however, to see that it is much more. It goes into the history of the school lunch programs and tells about several schools and districts that have reformed their school lunch programs into truely healthy learning environments. I wish that all school lunch programs would be so healthy and wonderful. The book also has some yummy recipes that I want to try out. 100s of studies validate that food dyes and additives are a factor in attention and behavior disorders and can increase the incidence of ADHD. In one of these studies, 73% of children on a diet free from chemicals and dyes and artificial sweeteners showed a reduction in hyperactivity and an increase in attention. 1.5 stars This book had to stretch to fill so many pages. The information it contained was nothing that people with a basic working knowledge of nutrition wouldn't already know. The recipes were not the least bit interesting to me, so I'm assuming the same would go for my children. I think the topic is so very important and I appreciate that the authors are bringing it to light. Tries to be too many things. Starts as a critique of the modern, public school lunchroom. Ends as a recipe book. Somewhere in between are suggestions for raising healthy kids that have to frequent a school cafeteria. Pretty basic stuff here for anyone that is already trying to shop local and organic. Recipes looked delicious though. I liked this book. I am going to buy a copy for myself sine I checked this one out of library. I enjoyed the recipes in the back. I expected something different from this, but still enjoyed the way they told us about schools that have transformed their lunch rooms by making them more healthy, vibrant and liked by students at their school. Couldn't read. So poorly researched. For example, they talked about how crowded and crazy lunchrooms are and how the NYC teachers' union had just won the right to not work in the lunchroom, to avoid the craziness. And I'm like, no, they want to not work in the lunchroom so that they actually get a lunchbreak. If only everyone had equal opportunity to healthy food. I rarely saw my school kids eat fruits and vegetables mainly because they were on free lunch. When they packed a lunch for field trips it was solid processed foods. Fresh food is just too expensive for many. How can we honestly expect these kids to perform as well as kids who have actual balanced diets? Great book, emphasizing the importance of feeding our children well and teaching them about wellness - good locally-produced food, active lifestyles, and home cooking. The recipes look great - I know I will try some, but some of them look way too time-consuming! I will probably borrow this one from the library again, if for no other reason, to check out more recipes. There are some really tasty recipes in there, plus some great tips on how to introduce more wholesome choices into your diet. Of course, I still have to have Jack in the Box tacos now and then, don't ask me why. They are just so-o good! I loved this book- more than I thought it would. A fantastic argument on the importance of helping children create a good relationship with food in the home as well as in the educational system, as well as the importance of what we feed our kids. 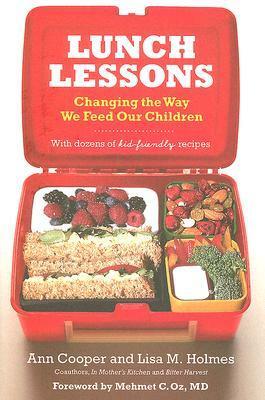 Fabulous book about the importance of what we feed our children (and ourselves)! Part information, part recipes. Some of the recipes are a little more than I would do--using multiple ingredients I don't typically purchase. But I love the concept and can definitely adapt a lot of the recipes. An excellent basic reference to healthy eating, green behaviors, with a focus on children's meals. Lots of practical healthy recipes also. This book should be part of grammar school curriculum as a part of our approach to the obesity epidemic in the US. Read this book in order to write a paper. Really informative for my paper. At times, I felt like it may be less applicable to the target audience but maybe someone would take a stand against their district's lunch program. I more or less skimmed this book as I no longer have children at home. It's pretty hard-core although the recipes do include things that kids will like and they aren't completely anti-fat, etc. Interesting tales of revamping school lunchrooms.